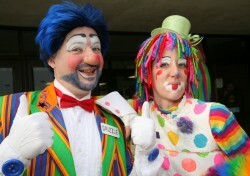 WELCOME TO CLOWNING 101, an online "book" centralizing Andrew ("Drizzle") Bedno's research, and Susan ("Sweetie") Hooper's experience, on the subject of clowning. The chapters below sequentially covers the required skills for professional level clowning in order of importance, from fundamentals to graduation. The book begins with an introduction to the topic of clowning; then proceeds through the prerequisite skills: ACTING (including improvisation and movement), MAKEUP (including character design), COSTUME, SKITS (including walk-around, gags, and acts); culminating in SHOW (and rehearsal). The final chapters HISTORY and RESOURCES are for reference. HISTORY lists great clowns and comics by era, mostly from film and television, and also features a definitive reference to circus and clown related movies. RESOURCES contains the glossary, as well as links to sites for vendors and organizations. In each chapter and its subsections, please read the article at the top of each subject first, then proceed through supporting content and links.